Hikawa Brewery offers up something needed, but also different, in a city that lacks choices for craft beer. The atmosphere reminded of a British pub – lots of people talking to each other and warm inside. The only downside is the prices, which seemed to be quite high for a brewpub but don’t worry about the pours as they do get topped up and they are UK size glasses. The whole place is non-smoking, has no table charge, and all the prices include tax as well. There was some English on the menu too but the staff did try to explain things without us asking, again bringing back the idea of a British-style atmosphere. Hikawa Brewery opened up in November 2015 and is Omiya’s first brewpub, but in a city that offers up zero other choices for craft beer, that was a surprising comment to hear. It’s not that Omiya couldn’t support a number of craft beer bars, but I guess there is just no space for any near the station. Hikawa Brewery is located about a ten-minute walk from Omiya station, and is conveniently located near Higawa Ryokuchi Park – so get the beers in and celebrate Hanami, Koyu (changing of the leaves), or any other Japanese festival that means you can drink until your heart’s content. To say Hikawa Brewery got their interior decoration from the Bakushu Kobos would be an understatement – between these two places, Japan’s supply of wood is facing serious demands and may run out soon. Wood here. Wood there. Wouldn’t surprise me if there was wood in the beer too. The majority of Hikawa Brewery is standing but there are some tables for seating too. There is usually anywhere between 5 to 10 taps of craft beer on at Hikawa Brewery, with all the beers being brewed in-house. Every time I’ve looked at their menus online, they’ve not had any guest beers on tap – not to say that they don’t, but I doubt that at the sizes they are serving at Hikawa Brewery would make any money off of the guest beers. Beers come in two sizes: UK half pint (280ml) for ¥600 to ¥750, or UK pint (568ml) for ¥1100 to ¥1300. Not cheap for a brewpub, but seeing as they include tax and they are “proper” pints (sorry American readers but 470ml just seems, well, small). I didn’t notice any happy hour, nor any beer flights on offer either. They also offer up their beers in growlers and also plastic bottles, if you have some going. 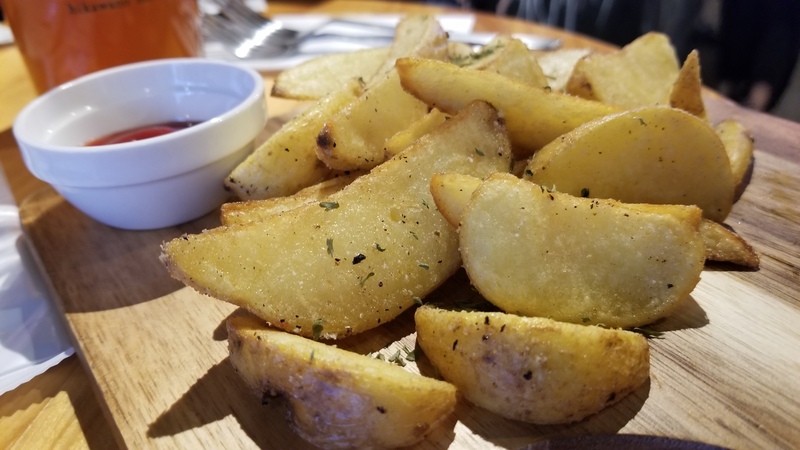 The food at Hikawa Brewery is more European-centric than Japanese, with lots of fried stuff and snack things on the menu. All the menu was in Japanese but the staff did try to explain some of the kanji, it was handwritten you see, for us but as soon as the words “chips” came up, that’s all I wanted. The closest station to Hikawa Brewery is Omiya on the JR Takasaki Line, Shōnan-Shinjuku Line, Ueno-Tokyo Line, Keihin-Tōhoku Line, Saikyō Line, and Kawagoe Line, as well as Tobu Urban Park Line and the Ina Line. The brewpub is about a ten minute walk from the east exit.